Ten years later, standing on a deteriorating Madison Valley ranch, looking out at Ennis Lake and the Madison range, they knew they’d found it. 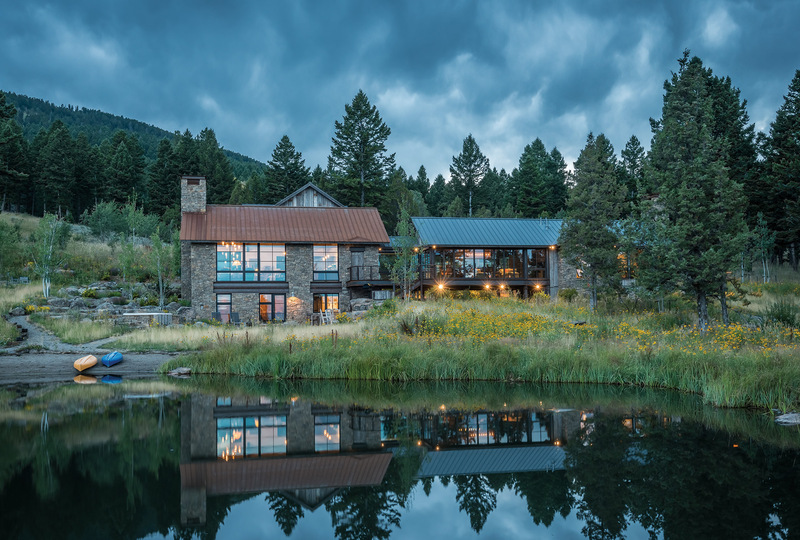 The property was full of character: The existing structures included a dilapidated 1863 pioneer cabin and a granary, and the land varied from forest to pasture with coulees, gullies, water features, and a 2,000-foot change in elevation from one end to the other. Once they purchased the ranch, the family was again guided by patience; it would be another 20 years until they built the main home. But in the meantime, they bought an additional 40 acres and built a structure with an apartment to serve as ranch headquarters and a place to stay during visits. 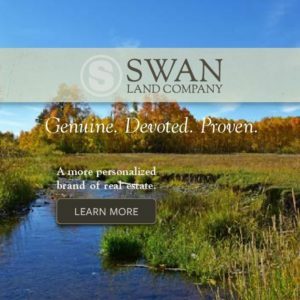 They worked on rehabilitating the land, wetlands, and existing buildings, and put the property under conservation easement, slowly turning it into a sanctuary where they, along with their five children, 12 grandchildren, and many friends, could escape the hustle and bustle of the city. “But he didn’t retire!” the wife adds. 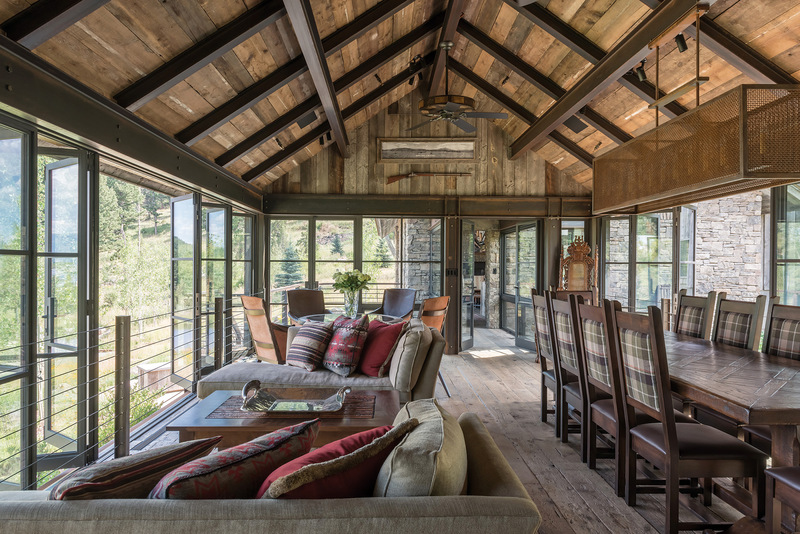 The end result was a one-of-a-kind design with a mountain rustic aesthetic and a contemporary edge. 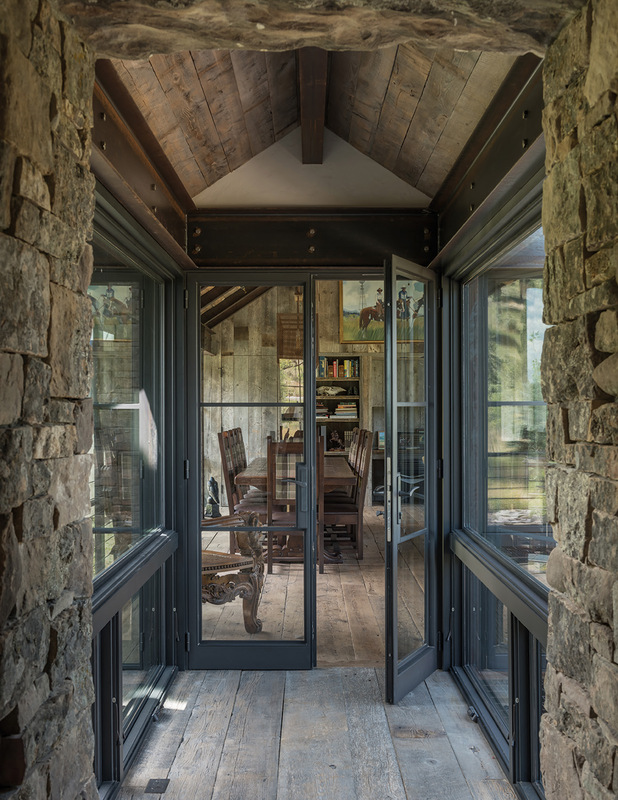 “I needed to contrast the idea of a mountain house tucked in the woods with the idea that these people were eclectic, there was something contemporary about them,” explains JLF senior design principal Paul Bertelli. When they decided on a building site near a wetland area, Bertelli and his team, which included partner Jake Scott and project manager Shawn Lund, proposed a glass- and steel-lined bridge over a creek to connect two living spaces while also serving as a link between classic and contemporary designs. 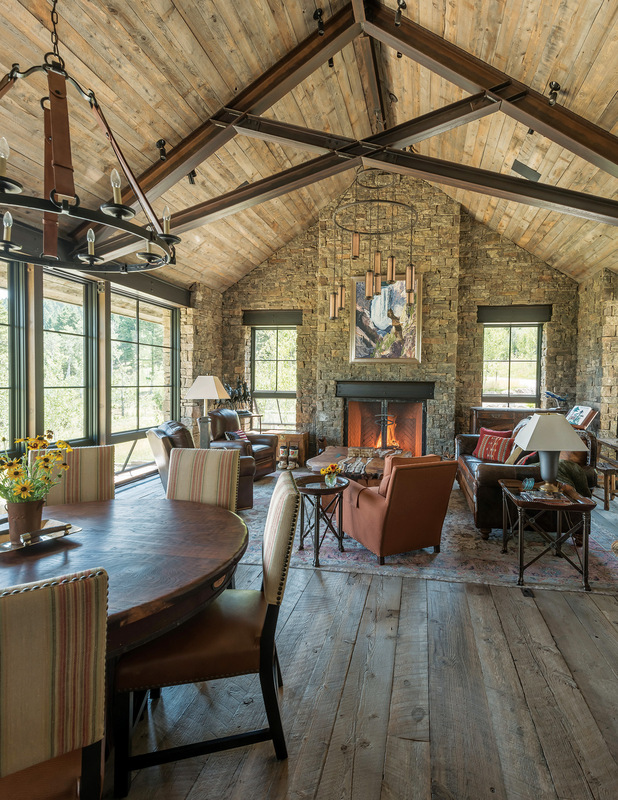 On one end sits a modern reclaimed wood-sided building that houses the master bedroom, and on the other is a stone-based structure with guest bedrooms and the main living spaces. In order to accomplish this, On Site Management (OSM), built foundations on either side of the creek. The bridge is lined with floor-to-ceiling glass panels that open to create a link to the outdoors. It’s where the family spends most of their time when indoors. While the interior feels spacious at 5,000 square feet, the exterior appears modest in size. “Our way to pull it apart, with the bridge, reduces the mass,” Bertelli explains. “And when you pull it apart you can use different materials.” The roofs differ in materials and colors, just as the siding does, yet it all comes together well, appearing weathered, somewhat historic, and fresh at the same time. When it came to the interiors, the couple worked with Catherine Lane, of Catherine Lane Interiors, who used local artisans to make custom pieces and hunted down other pieces that aligned with the couple’s existing collection of art and artifacts. Unique touches are sprinkled throughout, such as a Lewis and Clark plaque that’s built into one wall, 250 million-year-old fossils in another, and a custom totem pole. However, the house remains but one part of the ranch. The family spends most of their time in the outdoors, whether they’re fly fishing on a local river or the stocked ponds, hiking, horseback riding, kayaking, or clay shooting. They also seek solace in the outdoor spaces with numerous hammocks placed about, and six different grills set up in favorite picnicking locations. For this family, it seems that patience paid off. 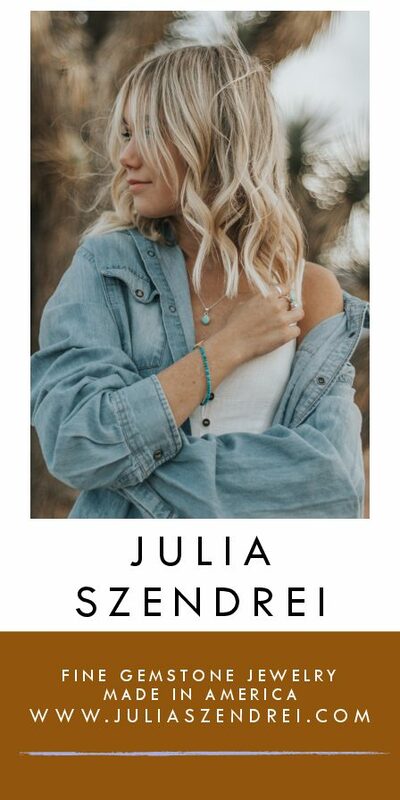 From a ranch that was falling into disrepair, they’ve created a place to relax and unwind, and also a place for their kids and grandkids to explore, stargaze, and experience nature away from the big city. The homeowners appreciate storied display pieces, such as this limited-edition plaque, released by the Montana Historical Society for the Lewis and Clark bicentennial, that they had built into a wall. The glass- and steel-lined bridge that connects the two parts of the home is a favored interior hang-out spot, featuring a dining and sitting area, a game table, and a small office. 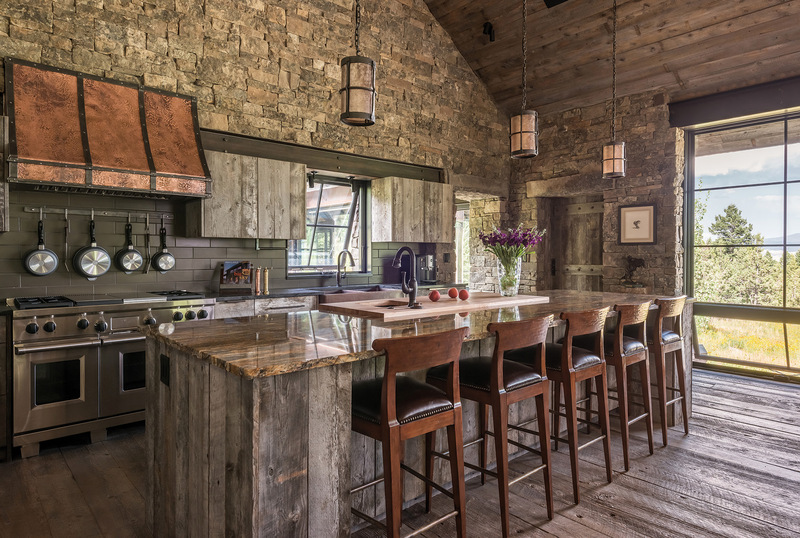 When the homeowner fell in love with a copper and steel range hood from a magazine, designer Catherine Lane had it custom built in Montana. 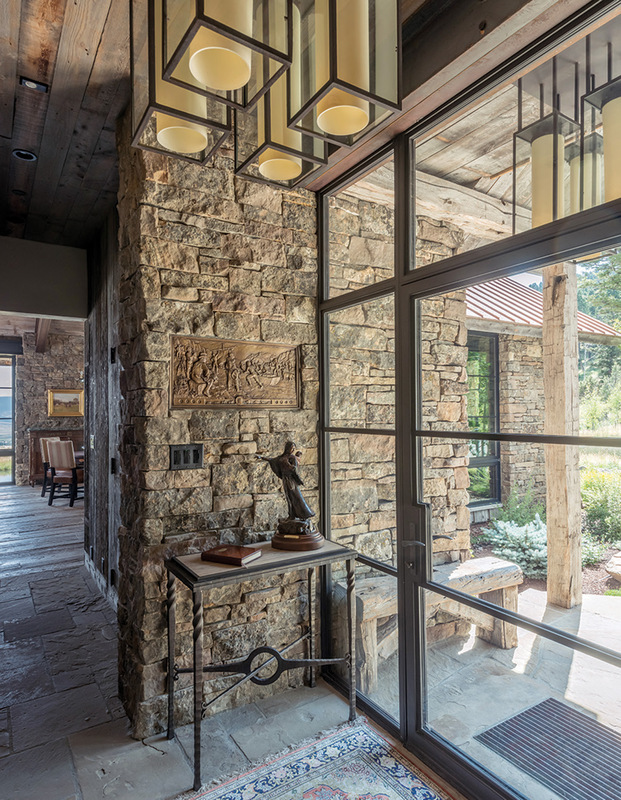 Lane had many of the lighting fixtures custom made, along with a painting of one of the homeowners’ favorite places, the Grand Canyon of the Yellowstone, by Gardiner, Montana, wildlife artist Todd Fredericksen. The rustic mountain home faces out toward a stocked pond, with views of Ennis Lake and the Madison Range in the distance. 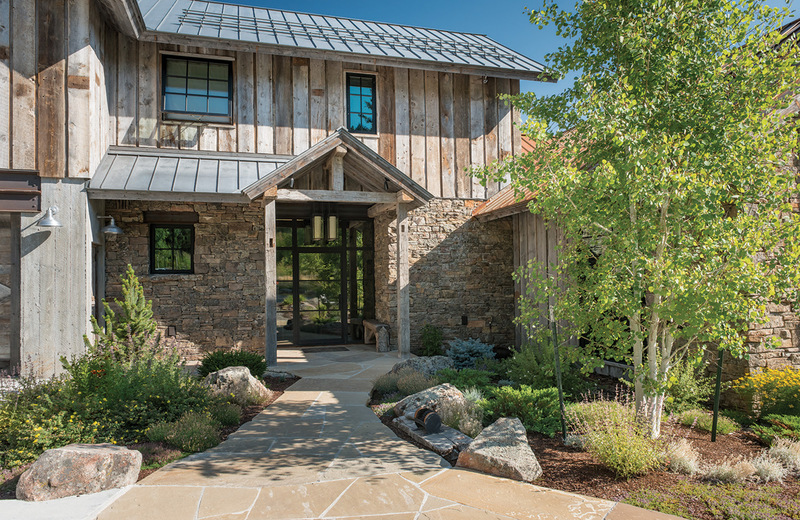 The wing of the home with barnwood siding sets the master bedroom apart from the other living spaces. 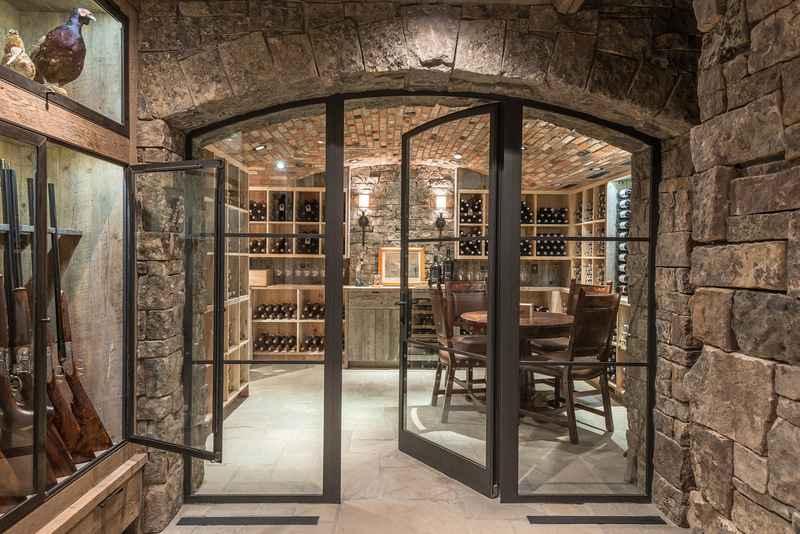 The homeowners’ gun collection lines the entrance to the wine cellar. 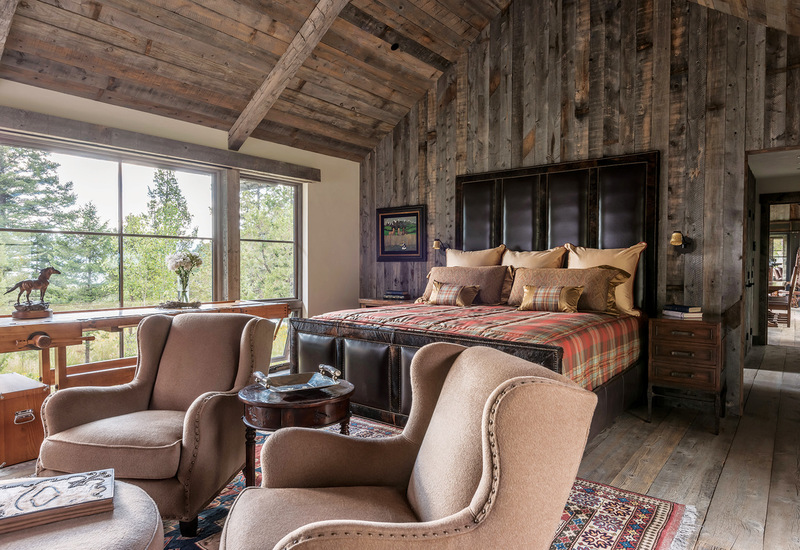 The rustic materials used, such as the wood on the walls of the master bedroom, serve as design elements in their own right, leaving little need for artwork.